I didn’t quite end up having a slow down weekend after all. My friends and I braved the elements on Saturday and had a blast meeting up a movie (Notes on a Scandal which was very good) and a belated Christmas gift exchange. I got a subscription to Bookforum! Thank you Christine. Sunday has been a glorious sunny day and I spent my morning on Rodeo Drive buying rubber stamps. Yes, another rubber stamp convention was in town and they were at the rodeo. Only in Texas right? Actually it was in the convention hall next to the rodeo but obviously this was the only way I’d ever go near the rodeo. 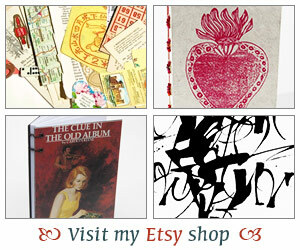 I found some nifty rubber stamps, charms, antique book pages and other trinkets for projects. I even met the founder of Altered Arts magazine. If you are into altered books I do recommend that publication. I have found it to have some interesting projects and there are always good, detailed instructions for the featured projects. My favorite stamp from the show is this one. Isn’t it great? I can just see myself now, guerilla bookworm leaving my mark around town. Love it. oooh. i love the stamp! i want one. The stamp is great! And a rubber stamp convention sounds wonderful! I love the stamp. 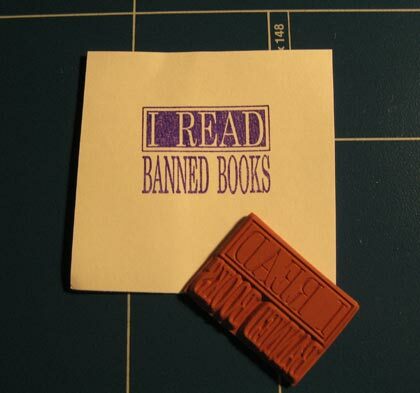 I can just imagine you stamping banned books in your town’s library with that!! Haha!! But you know, I think that would look cool as a t-shirt too. haha that IS great! I love stamps and paper and all that stuff too. I’m starting to think it goes with loving books. Good fun! I can just picture you in a camoflage outfit of sorts, stamping people’s foreheads!! Cool stamp! I love all that altered art stuff–if only I had more time…..
Saturday was a lot of fun and we must do that again soon. I think Shadan had something to do with the sunshine on Sunday..wishing all that rain away. Patricia – Isn’t it cute? Tanabata – We’re pretty lucky here as we typically get 2 or 3 a year! So fun although hard on the pocket book. ha. Kisane – Oooh a tshirt with that would be great indeed! Nik – I believe that. I’m obsessed about both. Heather T. – I really want to do that now. ha,ha. Danielle – Yes, the time factor can be a problem can’t it. I need more! Shadan – If I find that one I will have to get one for me too what with all of my issues at the post office. hee. Nancy – It was tons of fun. Now I need to use my stamps. Great stamp! Sounds like a very fun weekend. Altered Arts mag looks very cool. I’m another paper/stamping/crafts etc lover. I love the stamp. I would have to add another one: I Band Read Books. What a fun weekend, and I love the new stamp! Was Notes on a Scandal based on the book? If so have you read it? Someone described it to me as very ‘weird’. And yes, the stamp is fantastic. If we were in the world of Farenheit 451, which banned book would you be? That’s so funny that the rubber stamp convention was next to the rodeo grounds, because here, all conventions like that are in the big hall next to the Nascar racetrack. And like you, if it weren’t for events like those, I’d never go near the place.